SMART Mini AUX Bluetooth Car Kit with Hands free Calling with a Sensitive Mic / Wireless Music Streaming for Android Smartphone's , Apple iPhone , Blackberry , Tablets, MP3 Players & More! ATTENTION!!! Please charge your device before first time use. Otherwise some functions will not work. Plug the car kit into the auxiliary input of your vehicle. If necessary, use the audio dock to relocate your auxiliary input to a more accessible location. Using the car speaker to enjoy music and the phone call. Superior Bluetooth wireless technology allows you to switch between listening to your favorite tunes and making calls on the go! 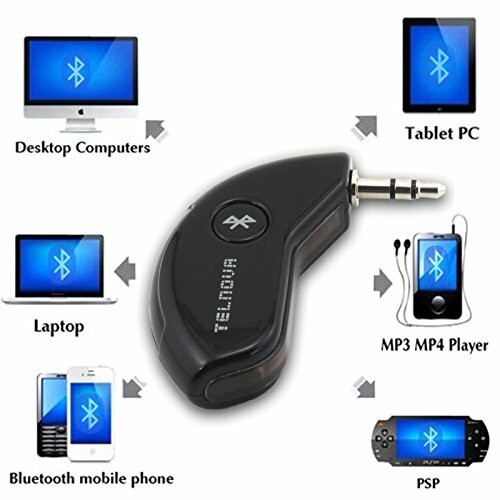 Works with your Bluetooth-enabled Smartphone's, tablet or mp3 player. Enhanced voice detection and noise cancelling microphone makes hands-free calling simple and easy! Compact and simple design - directly plugs into the AUX port on your in-car sound system while keeping a low profile. Note for Apple Users: If you are having Bluetooth connectivity issues, please try resetting the "Network Connections". Go to SETTINGS > GENERAL > RESET > RESET NETWORK SETTINGS. Auto-pairing makes initial set up hassle free. Package include: Bluetooth Receiver; User Manual; Micro USB charging cable. Share your music wirelessly from mobile phone, Notebook, PC, tablet pc, iphone and other Bluetooth device when connect with Aux speaker. Built-in microphone with Bluetooth hands free function. Built-in high capacity lithium battery 100mAh. Operating range 10m-20m (Depending on environment). Need to be charged in FULL before first time use with a wall charger for 3-5 hours. Supper low power charge standby. LED indicator. Micro USB charging. Supports Bluetooth v3.0+EDR and Bluetooth 2.1, Bluetooth 2.0, 1.2, and 1.1 backward compatibility. If you have any questions about this product by Planet E, contact us by completing and submitting the form below. If you are looking for a specif part number, please include it with your message.